The museum is located on the former site of Sitting Bull's camp, on the famous Garryowen bend of the Little Bighorn River, a traditional summer hunting campsite for many Plains Indian tribes. As the Seventh Cavalry approached in late June of 1876, this was the site of one of the largest Indian gatherings ever recorded in North America. Several famous locations associated with the Battle of the Little Bighorn are visible from Garryowen. These sites include Reno's hilltop defense site, Weir Point, Last Stand Hill, Medicine Tail Coulee, the Crow's Nest, the Wolf Mountains as well as the Little Bighorn Battlefield National Monument and Custer National Cemetery. The museum is open year round, admittance fees are $7.50 for adults and those under 12 admitted free. Groups and tours are welcome, with advance notice requested but not required. Extensive new exhibits: Cavalry and Indian artifacts excavated on the site of the Battle of the Little Bighorn join large dioramas showing step-by-step battle action. Such items include Little Wolf's Golden Eagle Tail Feathered War Bonnet, which was worn during many battles including the Battle of the Little Big Horn. The contract for Sitting Bull's appearance in the famous Buffalo Bill Wild West Show is on display and is the only known attested signature of Sitting Bull. Also exhibited is a facsimile of the signatorial rock pictograph attributed to Crazy Horse made on a sandstone cliff above Reno Creek after the Battle of the Little Bighorn. The original was destroyed in 1963. Indian War era artifacts include many items found at the battle site, such as Crow Dog's rifle, several war clubs and trade knives, cavalry spurs, and Flow-blue enamelware from sitting Bull's camp. Cavalry items on display include Tom Custer's Kerr revolver and an Army pistol dropped on the Reno retreat route, still fully loaded. Other Indian weaponry includes a Lakota lance made from a cavalry guidon pole, shields, and an U.S. Army-issue revolver with a holster decorated with Plains Indian style beadwork. Also on display are Beaded Indian War Shirts and an extensive collection of moccasins. Famed Indian War Period Photography Exhibit Over 100 photographs by world-famous photographer David F. Barry are currently featured. This collection is one of the largest displays of D. F. Barry on exhibit, and contains many of the most recognizable images of the American Frontier, such as General George Armstrong Custer, Benteen, Sitting Bull, Gall, Low Dog, and Tom Custer. These photographs have toured internationally and present a rare chance to view many of the participants and events that led up to the Battle of Little Big Horn. Other Barry collections are maintained at the Buffalo Bill Museum in Cody, Wyoming and at the Smithsonian Institute in Washington, D.C. The museum also features one of the shovels used to bury the cavalry dead, an Indian necklace made from one of the rings on General Custer's saddle, an early Sioux dugout canoe and ivory cavalry dice found in the Reno retreat area. A highly significant collection of battle-vintage bead work in addition to bronzes, paintings and other memorabilia create a highly educational tour through the vanished American frontier. Tomb of the Unknown Soldier The remains of this unknown trooper were found in 1926 prior to the 50th Anniversary of the Custer Battle. Presumed to have been one of Major Reno's men, one of the first Seventh Cavalry men killed in the opening phase of the battle in the river valley near Garryowen, Montana. Apparently high water in the spring following the famed battle, caused the soldier's body to be buried, and it was not found until the road crew building the US 87 highway uncovered it 50 years later. 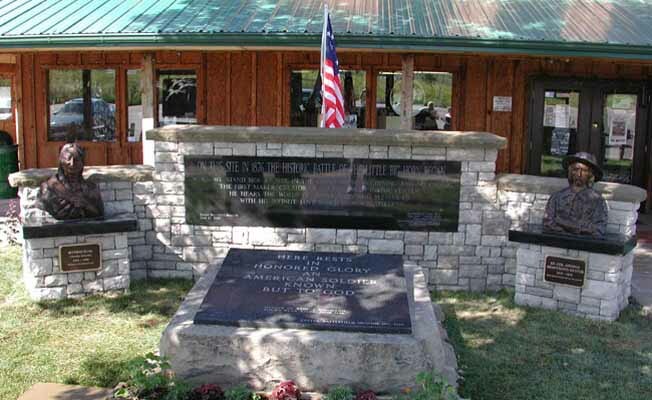 'Peace Monument' Now 125 years after the Battle of the Little Big Horn the Custer Battlefield Museum unveiled a new 'Peace Monument' which is located behind the Tomb of the Unknown Soldier. Featured on each side of the Granite Peace Monument is a bronze sculpture of Sitting Bull and General George Armstrong Custer. The Custer Battlefield Museum is dedicated to collecting and preserving the history of Western Expansion on the American high plains, including artifacts, manuscripts and memorabilia related to the Seventh Cavalry, frontier military life and Plains Indian tribes.